♥ I Love Lucy DigiArt Designs ♥: New Freebie Template & Tag! New Freebie Template & Tag! Just click the preview above to download from 4shared. Please leave a comment if you do! Here is a tag I made with it for the artist! Scraps are from a FTU kit called Devil's Mistress that you can get from SCRAP REBELLION. Thank you so much for this post. 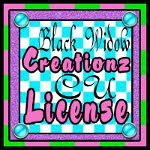 I want to let you know that I posted a link to your blog in CBH Digital Scrapbooking Freebies, under the Page 3 post on Apr. 03, 2011. Thanks again. Very nice! Really like this page layout!! !